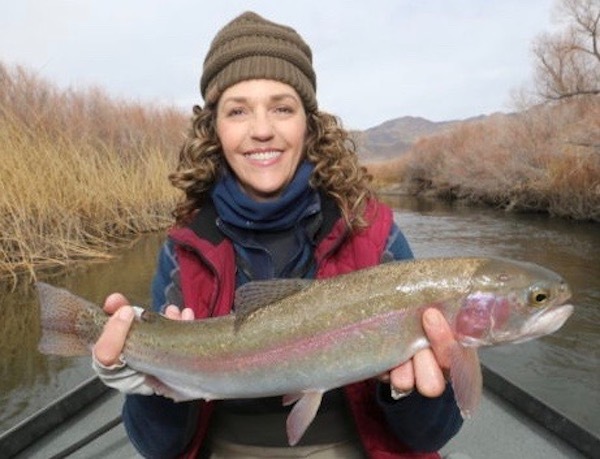 DeeAnn Davis caught and released this impressive rainbow while using a Spruce-A-Bu streamer pattern. The big bow crushed the fly right at “the banana”! (Inside joke.) Fun times with this family. The Pleasant Valley Campground Fire is now out, & access is open to the public. You will find good water conditions; however there are massive stands of burnt willow skeletons, & trees. There has been some fish kill due to the fire; however I have observed fish in the deeper pools in the wild trout section. The fire consumed Pleasant Valley Campground, down to Five Bridges Crossing.The section of the MO below the dam, down to the campground did not burn, & should fish as before the fire. Unseasonably cold air temps have slowed the bite in all sections of the Owens. The blue winged olive mayfly hatch is the one to hit. It begins most days around 1pm, & lasts until 2:30. Our drift boat runs were not affected by the fire, and are fishing well. The Upper Owens River has been slow. A series of cold core winter storms continue to hamper fly fishers on a quest for migratory Crowley Steelhead. ZERO air temps, gusty winds, and moderate snow accumulations are forecast through the end of the week. There are a few nice fish holding in the deeper pools; however numbers are not what we have seen in prior Februarys. Water conditions are good, with flows currently higher than the seasonal norm. The East Walker River has winter flow rates at 28cfs., & the “catching” is slow. This release rate will concentrate the fish in the deepest of pools only. With the unseasonal cold air temps you will see some ice, and moderate snow accumulations in the canyon. Hot Creek has some aquatic weeds issues due to low winter flows. There are good numbers of smaller fish concentrated in the deepest pools, and slots. Cold/windy weather forecast for the next week will make it tough for good dry fly presentations. There is a good chance you will see moderate snow accumulations by weeks end. Pleasant Valley Reservoir has picked up as the water level is currently good for access in the transition area. The fire did not influence this area. “Freeze tubing” has been good for those hearty fly fishers willing to kick around from the launch ramp to the inlet using full sinks, & streamer patterns. The small river section down from the powerhouse is good for wading, & casting dry/dropper bead head rigs. Gorge water releases are very low. LADWP is doing major maintenance on the hydro electric generation facility. Fish jammed into the deeper pools. The good news is that access to Pleasant Valley Campground, and Five Bridges Crossing are now open. The fish in the wild trout section, upstream to the dam at PVR appear to have survived the blaze. The bad news- this fire has left miles of scorched willows and trees, with stands of burnt willow skeletons, and tules along the river bank. There are reports of fish kill near the cement plant. Water conditions are good; with flows stable at 75cfs. The blue winged olive mayfly hatch has been consistent. It begins most days around 1pm and lasts for about ninety minutes. Use Assassins, flashback pheasant tails, hares ear, or small punk perch patterns for nymphing. The extended colder weather has diminished midge activity; however it is wise to have smaller larva and pupa patterns this time of year if the barometric pressure rises. Crystal tiger, and olive zebra midges, small gillies, crystal midge emergers, and pupa patterns #20/22 will get you grabs in the deeper pools while fishing properly weighted, tandem rigs fished below an Under-Cator. Drift boat trips have been consistently fun; with good numbers of planted rainbows and browns showing each trip. A few large rainbows are also smashing our streamers most days. The sections we float are well downstream from the fire, and I am happy to report that water clarity remains normal; with no ash concentrations I have observed. We are primarily pulling streamers using the “dip & strip” method with sinking tip lines. There are opportunities to dry fly fish during the BWO hatch some days, & the fish are focusing on this emergence. Spruce-A-Bu’s, Loebergs, & smaller Punk Perch patterns have all been fooling the trout. It is forecast to be windy, very cold, with periods of accumulating snowfall for another week. Numbers of migratory rainbows are down from last season. Water conditions have actually been favorable for a solid run on the UO. After numerous years of planting sterile “triploid” fish, the ramifications of this fisheries management (or lack there of) may finally be taking its toll. Triploids have no instinctual mechanisms to spawn; or migrate upstream. They remain in the lake unlike fertile trout that swim upstream to propagate. Sterile fish have been planted exclusively throughout the Sierra in recent years due to laws implemented in the past decade to protect the genetic integrity of native “west slope steelhead”. Changes in the fisheries management plan this year, mostly specific to this water shed, are permitting the planting of “diploid” trout once again. Hopefully we will see fish counts improve in the tributaries after a couple years. There are a few bigs around, covering a lot of water can get you a shot at a few of the elusive ones. Some smaller resident fish are sipping on midge clusters in the pillow water of the larger pools during periods of warmer weather. Getting your rigs on the bottom with water conditions like this require obscene amounts of weight, lengthy leaders, and aggressive mending tactics to achieve drag free drifts. Crystal Eggs, San Juan Worms, #16-18 Assassins (dark and light), #14-16 Crystal Leeches, and #16-20 Copper Tiger Midge, Zebra Midge, and Gillies have been good patterns fished with plenty of weight below an Under-Cator. The section upstream from the Benton Bridge is open year around with special regulations. Seasonal closures, and angling restrictions apply downstream from the bridge, check regulations before fishing in this section. We walk and wade guide here. During winter we will access the UO with snowmobiles. Significant snow accumulations, & polar bear cold here for another week. Numbers are decent here during warmer periods; with fish holding in the deeper slots and pools. The stream bed is blanked by thick aquatic weeds. This is normal for the lower water periods of the year. Best bite occurs during early afternoon when the BWO’s are emerging. Large midge hatches coming off during a high barometer. Dry dropper rigs with a #16-18 Para Hi-Vis BWO and a #22 Gillie dropper 12″-18″ below is a consistent rig currently. When you observe those noses sipping the adults in the suds, remove the dropper, and dope up those high wings so they ride high on the surface. Longer leaders, & light tippet in the 5-6x class is best. During off hatch periods try attractor patterns fished without an indicator. You can get into some of the larger fish using this method during the winter months. This is a year around fishery with special regs in place. We walk and wade guide here. *Tom Loe, Doug Rodricks, and Doug Dolan are under permit from the Inyo National Forest Service to guide Hot Creek. The lake and powerhouse were not impacted by the fire. Water levels have come down to optimum levels for fishing the inlet/transition section. Dry/dropper rigs are the hot ticket for trout sipping on midges, & mayflies in the transition section. Still water addicts can get their fix here all winter. This fishery is planted all winter, & can provide some excellent fly fishing opportunities from a float tube; or near the inlet section that feeds the reservoir proper. Full sinking lines fished along the steep shoreline drop-offs using patterns like Loebergs, Crystal Leeches, Parallel Punk Perch, Parallel Agent Orange, & Spruce-A-Bu’s are good calls for “freeze tubers” during the winter. Locals call PVR “little Crowley” as fly fishers in the know will use still water nymphing techniques to score big numbers during periods of stable water levels. Set your “Under-Cators” to suspend those broken back midges, crystal tiger/zebra midges, gillies, & Assassins around the 12-14 foot depth. The inlet section is historically the most consistent section to fish. This diverse fishery also allows you to move into the short river section that feeds the lake. Looking much like the East Walker, this short; but sweet section has plenty of pocket water and riffles that hold holdover rainbows and browns that move into the heavy brush during periods of lower flows. Dry/dropper rigs using para hi-vis BWO’s, Stimulators, and hi-vis caddis patterns as your upper; with crystal tiger midges, crystal olive caddis larva, & parallel; or standard assassins as a nymph. The transition area that dumps into the lake has slower moving/deeper water that requires the use of an Under-Cator, or longer dropper off your dry. This is perhaps the most fertile area of the lake, & competent roll casters may get huge days here while making extended drifts in the foam lines. The trout will concentrate here to feed on the abundant chironomid, & mayflies that come off throughout the cooler months. Keep this fishery in mind if the weather gets nasty in the higher elevations. Fishing has been slow here due to very low flows. The fire did not impact this area. The best bite occurs during the BWO hatch mid-day. Use lighter weight rods here with a mayfly adult or go with a dry/dropper combination. Our Parachute hi-vis BWO is an excellent pattern as your dry. FB PT’s, Assassins, & small midge emergers are good calls for the dropper nymph.